I have a favorite canyon I visit on the east slope of the southern end of the Sangre de Cristo mountains. There's a creek that runs through this canyon that has a few nice trout-filled pools. You'll see fish of all sizes, from fry to 14" whoppers, all stuck in these pools with little more than a trickle for a water flow. 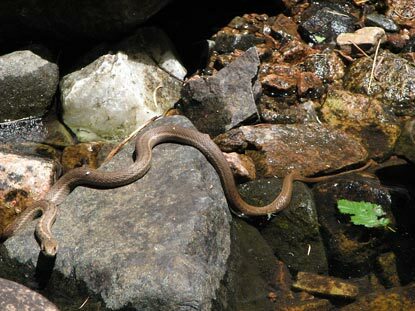 You'll also find some fishing terrestrial garter snakes (Thamnophis elegans). They have developed a special behavior that lets them get away with it. 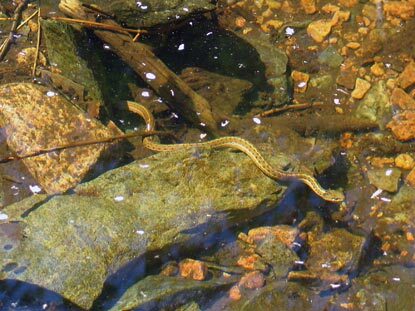 As they move underwater through these pools in their attempt to ambush a fish, they sway to and fro and move somewhat jerkily, as if they were fallen branches buffeted by the current, one that just happens to not really exist in the pools they fish in. 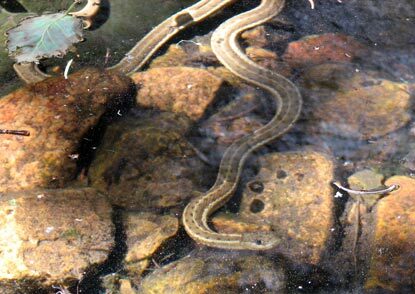 Obviously, the snakes are smarter than the fish in this instance.